In terms of stand-out fixtures for the coming midweek, this one shone like a beacon. Cleethorpes Town had played seven and won seven whereas Basford United had played seven won six and drawn one. They sat first and second in the league, it promised much, but would it deliver? Firstly though, the history of these two clubs is pretty staggering. 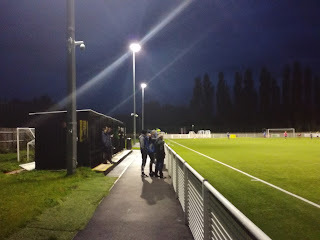 Basford United were an ailing Nottinghamshire Senior League side until 2011 when they made the move into the Central Midlands League, where they won the Southern Division at the first attempt. The following season they joined the East Midlands Counties League and won that with a record 95 points. This lead to promotion to the Northern Counties East League Premier Division, where they finished fifth, but they were moved sideways for the following season to the Midland Football League that they in turn won. The move was then made to the Northern Premier League First Division South, an incredible sixth different league in six seasons, which has to be some sort of record. Chris Munroe, the man behind the Inspirepac company in Chesterfield took over the club and has gone on the create something that is indeed very special. 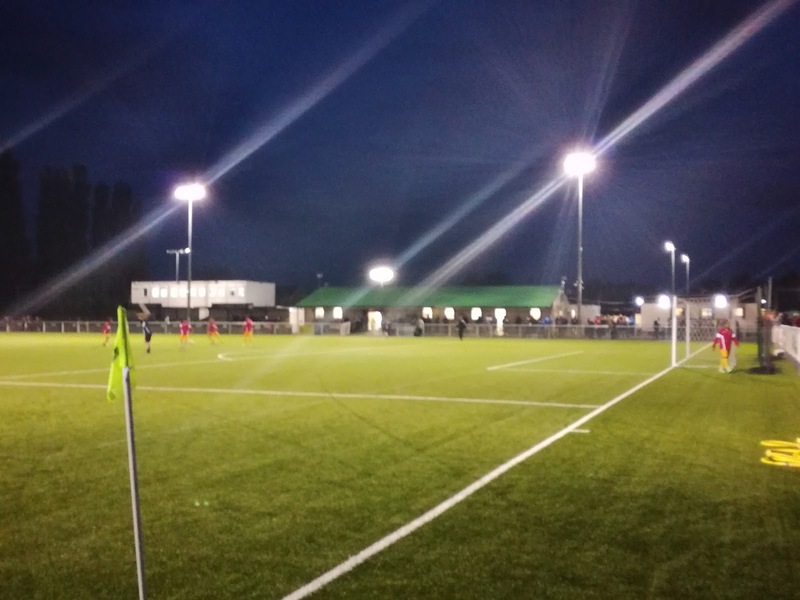 The ground has been developed beyond all recognition from the time I first went in the Notts Senior League, with a 4G pitch, stands on three sides, a new clubhouse and dressing rooms, plus classrooms for the thriving academy that is already reaping rewards. Chris has also been patient, now in their third season at this level, he has not demanded further progress, rather a period of consolidation after their rapid rise, but you do sense that this season under the stewardship of Martin Carruthers, promotion will be the target. I guess the only downside to Basford’s remarkable rise has been the fact that the locals have not got behind it as you would have hoped. Crowds are ok, but not fantastic, which is a real shame as the facilities are good, car parking is plentiful and a tram stop sits nearby. You can’t criticise the promotion or marketing of the club, they just seem to be dealing with apathy on the West side of Nottingham City Centre. Cleethorpes Town is another special tale. The old LSS Lucarlys side was re-named in 2008 and in their first season under the new guise, they had a pretty average mid-table finish in the Humber Premier League. The future didn’t look so special the following year when they resigned from the league mid-season, but they re-appeared again in the Lincolnshire League at the start of the 2010-11 season. A third placed finish, followed by a Championship saw them take promotion to the Northern Counties East League. 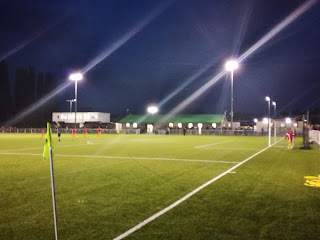 By now the club had moved from their traditional base at Linden Homes Club and were sharing the Bradley Community Stadium with Grimsby Borough. The first season saw a fourth placed finish but the following season saw another Championship, and with it promotion to Step 5. Playing great attacking football under Marcus Newell, they finished 4th, 3rd and then finally the Championship was won last season and a promotion to the Northern Premier League. But, on top of that they also reached Wembley in the FA Vase Final, only to lose to a rampant South Shields outfit. 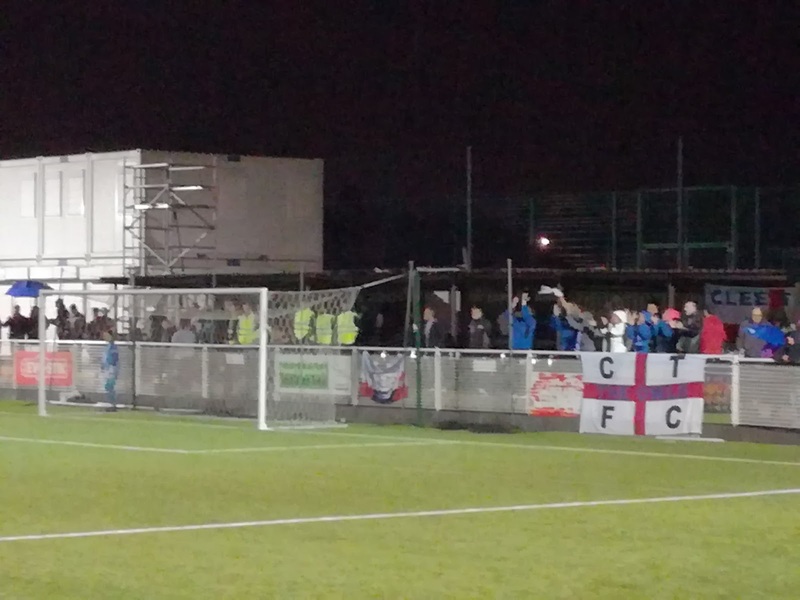 The one thing Cleethorpes have which Basford would surely like is great support. The crowds do turn up at the out of town stadium in Bradley, and with plans to move back to a redeveloped Linden Homes Club, you would think the spiritual home would engender more support? The kick off at a wet Greenwich Avenue was delayed by five minutes due to the late arrival of Cleethorpes, but after a tight opening it was Basford who took the lead via a Lewis Carr header in the 15th minute. Two minutes later the scores were level when a deep cross found an unmarked Matty Coleman just six yards out and he steered the ball beyond Saul Deeney. Basford then missed some great opportunities to regain the lead but a combination of poor finishing and good goalkeeping kept the scores level. Cleethorpes took the lead early in the second period when a foul by Ash Grayson lead to a penalty, which Peter Winn duly despatched. It was all Basford after that and they got the deserved equaliser when Luke Mascall’s foul on Corey Grantham saw a second yellow, a red and also a penalty. Ben Hutchinson stepped up to score and decided to celebrate in front of both sets of fans behind the goal. This led to a confrontation and some ‘handbags’ between the fans which then meant a thin yellow line of stewards had to be deployed to keep them apart. 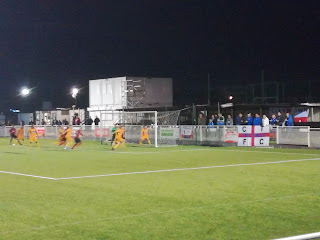 Basford continued to pour forward but couldn’t find the winning goal, and they too had a nervous moment very late in time added on when Carr’s second yellow also lead to a red card, but from the resultant free kick the shot from distance was wide of the target. I suspect on reflection, Cleethorpes will probably be the happier of the two sides, they were on the back foot for large parts of the game, and after a less than ideal start due to their late arrival, they probably would have taken a point if offered it. The game was a real credit to the Northern Premier League though, always engaging and with it intriuging. Basford will be cheered by the fact 200 spectators turned up to watch it, and it’s the least they deserve given the efforts Munroe, Carruthers and all of those behind the scenes have put in to make the club the success it is today. If I was a betting man, both of these sides will be gracing the Premier Division next season, and I don’t think anyone will begrudge either club that achievement. Please be advised. The celebration by the Basford player, whilst perhaps ill advised, was not the root of the issue. Also no Cleethorpes Town fans were at fault. 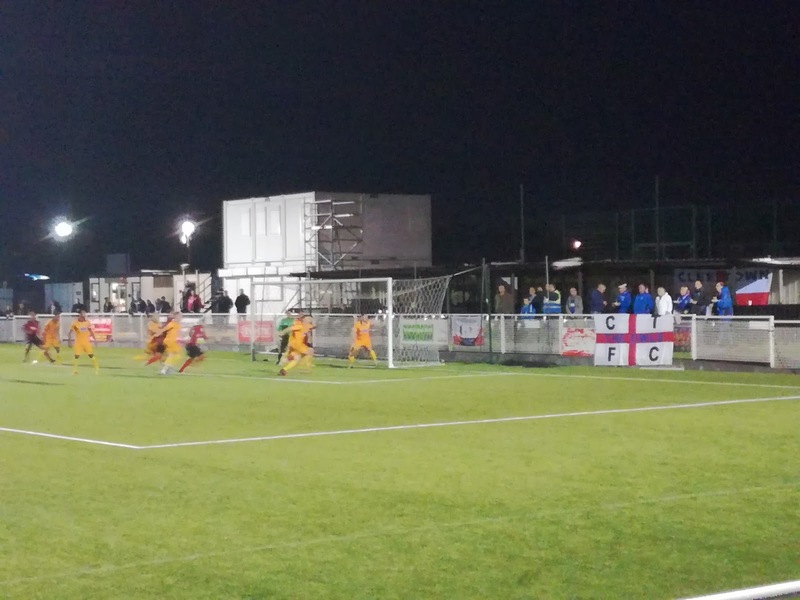 Basford United officials who were excellent in their handling of the situation subsequently apologised to Clee fans that were caught up in the incident and assured them that the person at fault would be dealt with accordingly.